Hope you captained him anyway. 2 goals and an assist after coming on in the 62nd minute. hoping that Salah brace the other night against Red Star is what gets his goal scoring started for the season. Gomez and Robertson rotated out for Liverpool this week. Solid from Salah, 1 goal and 2 assists. Could've had a pen as well, which he probably would've taken. Safe to say that i'm locking that score in for captain. Does anyone still post Break Evens here? Zaha to Alli my likely transfer this week. Alli and Eriksen both back playing UCL. Its a bit early, but Spurs have some nice fixtures after GW15, and don't really want Zaha anymore. Bernardo Silva, probably worth keeping while De Bruyne is injured again. Boy, this site has died a death -- anyone even still playing? yeah, still going, have been trying to save trades in RDT as we know in this game the double gameweeks will come later in the season. 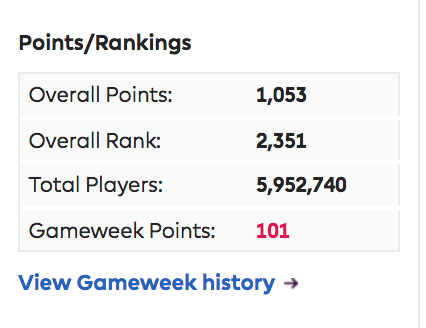 FPL team has been improving slowly but surely.